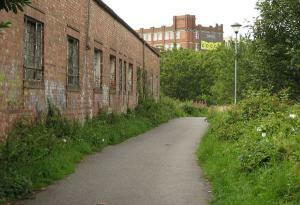 What remains of the old Rowntree’s factory faces Haxby Road, but is best viewed from the cycle track to the south-east. From down here, where the trains used to run, the view doesn’t look much different. Confidence and something approaching grandeur in that huge corner building, the Almond Block extension, so prominent on the skyline. I’d always seen it as a welcome landmark on the way home. 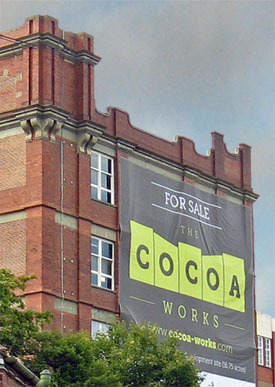 Not so when heading back home one afternoon in July 2011, seeing it draped with a massive For Sale sign. I think we’d all accepted by this point that Nestlé couldn’t hang on to a load of older factory buildings and that investment in the more modern facilities was more important, if it safeguarded jobs. But we didn’t need the big proclamation hanging off this place we’re so fond of. Meanwhile, over at the other side of town, Terry’s. Despite the demolitions of peripheral buildings, reported on back in March, here more of the factory has been preserved, in the sense that we’ve kept the buildings. Nestlé removed more buildings but at least kept a large workforce and a presence in the city, rather than abandoning it altogether and clearing off elsewhere with our ‘chocolate heritage’, as Kraft did with the ‘Terry’s Chocolate Orange’. This famous factory stands rather marooned, its clock faces looking battered, windows broken, handsome interior woodwork sprayed with pointless graffiti. 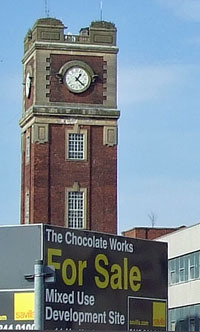 It has been marketed as The Chocolate Works, and at one time the perimeter had many large ads with particularly irritating ‘aspirational’ images. Man in a nice suit, in an expensive looking leather chair, under the caption ‘It’s time’. Presumably a nod to the Terry’s clock, referencing the history of the place in a way that didn’t happen, not surprisingly, when developers were marketing the old gasworks site. It will be interesting to see what happens to The Cocoa Works and The Chocolate Works. It seems most likely both will be empty for a long time, decaying slowly, with their decay hastened by lead thieves stealing bits of roof. Not everyone who trespasses goes in to steal. Some go just to take photos. Want to see how they’re looking inside? See the links below. Though former workers may find the images of vandalism rather depressing. I’m heading on to Haxby Road to admire what’s left of the Rowntree factory and its associated buildings. Terry’s factory, including photos of the interior, and more, very recent (Dec 2012). See also a 2007 report, which includes photos of some of the murals of Terry’s products probably since obscured by graffiti. The place is clearly being vandalised on a fairly regular basis. Also explored on a regular basis by people with cameras. In fact it appears that almost everyone but me has been in there.